Wanna know what I mean? Check out the picture below! Yeap! 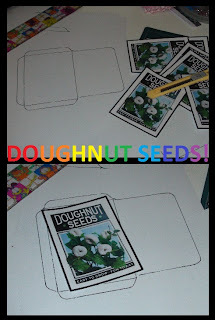 Doughnut seeds! In the past few days, after some research. I found out that doughnut seeds grow on plants! Interesting eh? They can be obtained from plants, OR made by dough! Unbelievable? Believe it! Nahhhh, I was just kidding. Doughnuts don’t grow on plants! It’ll sure be fun to have some doughnut seeds around though. And that is how this little post came about! About a week ago [I think], I printed some ‘Doughnut Seeds’ packages. Drew my own package outline and stick them on, then I put little doughnut-seeds-look-a-likes inside [Cheerios]. Cheerios the breakfast cereal! I made a few packets and gave them out in school. A few people got tricked that there really were such things though. And it got a few teachers confused and curious. Pretty fun to play with. I think it’d be great into getting kids to have fun eating cereal! Doughnut seeds for breakfast, how cute!